Bell tents are beautiful but at the same time, very practical, and in our view they outperform nylon tents in every way! Being made of canvas, means that they are heavier but the end result holds no comparison. 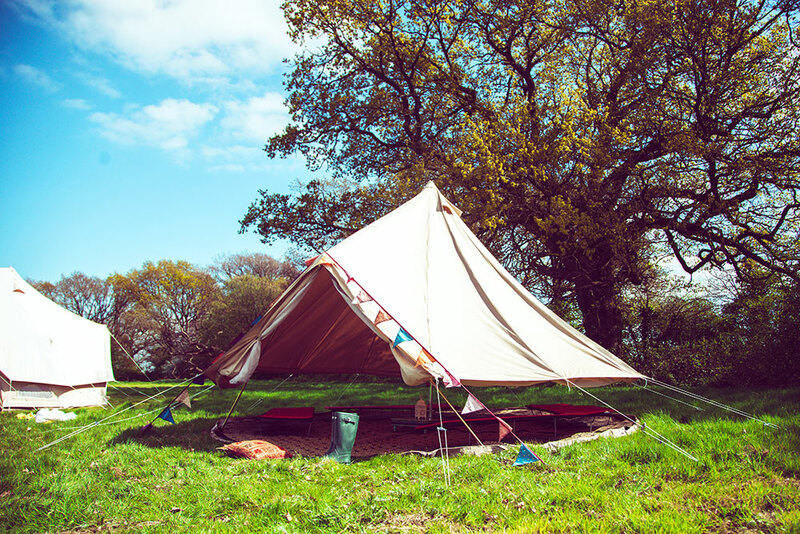 All of our Bell tents come with a zipped in ground sheet that is fully detachable from actual tent. You will be completely protected from the elements and on warmer days you can simply unzip and roll the sides up, creating a wonderful, shady space to chill out and relax in. 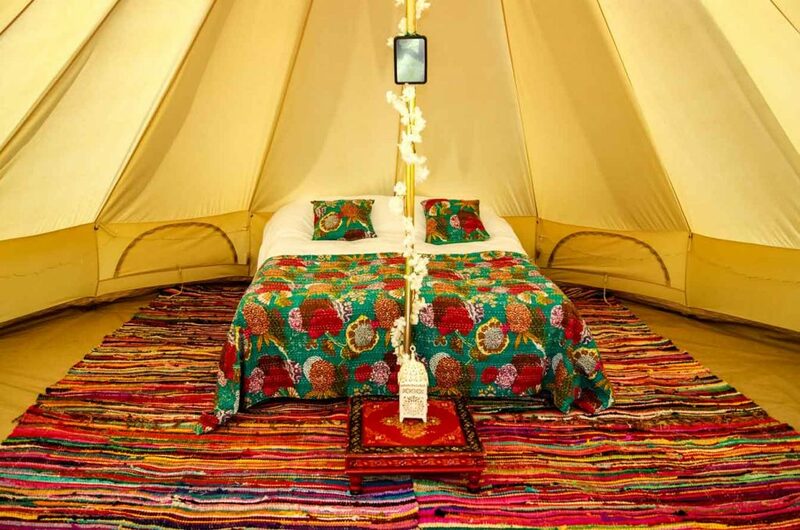 Our bell tents are all naturally coloured canvas which helps to blend in with the environment. 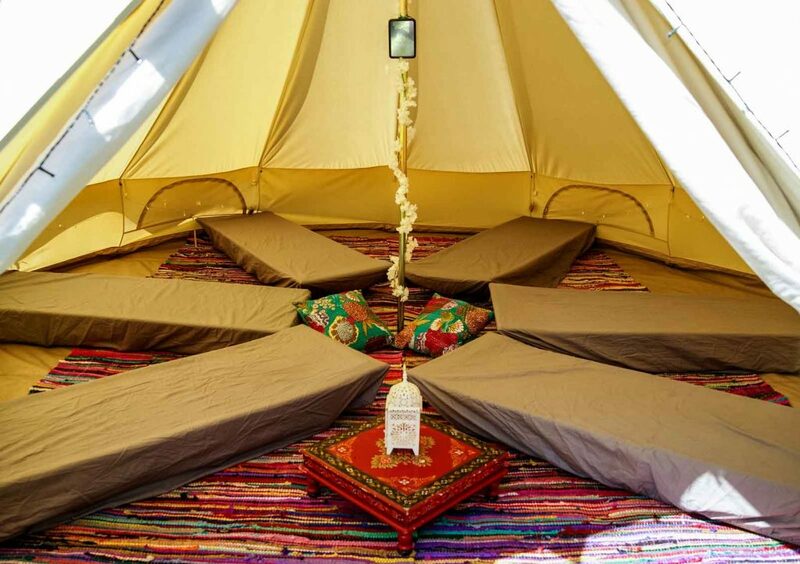 The bell tent’s versatile shape means that the inside is a wonderfully open plan, communal space with lots of head room. 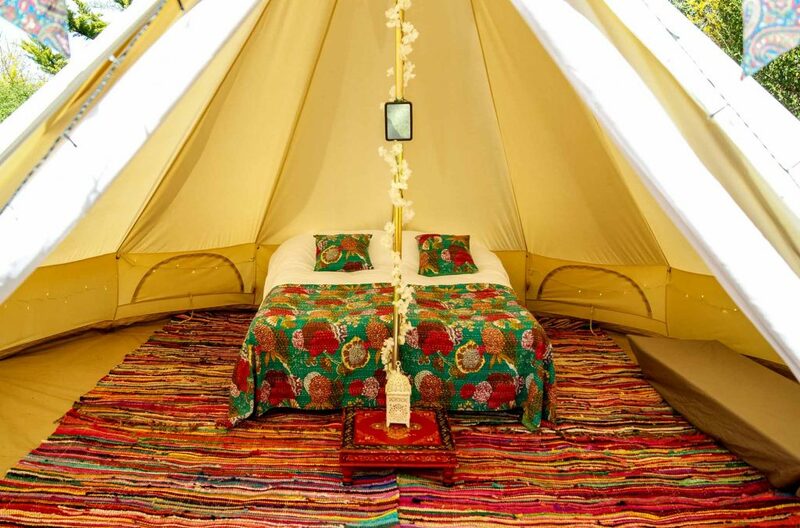 The warm ambience of a bell tent is very inviting even on the dullest of days. So versatile! 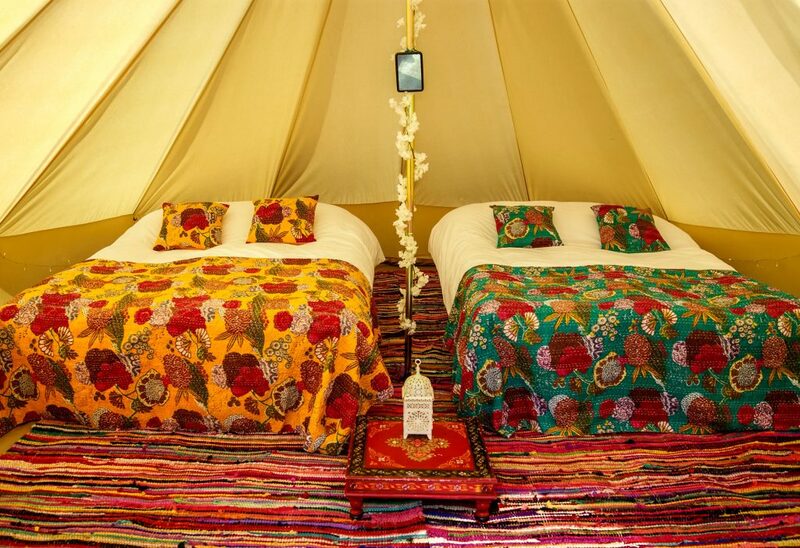 The bell tent has a number of uses. As well as camping, it fits perfectly for wedding and party accommodation, kids party/play areas, garden shade/chill out areas and treatment/massage rooms. When it comes to dressing and decoration, we like to create a luxurious and chic interior whilst being mindful of the environment. The options are endless, and we welcome any suggestions and ideas that you may have with regards to the interior look and feel that you want. Prices are for up to 3 nights. Please note that these are our basic tent prices and festivals and other events may charge more. 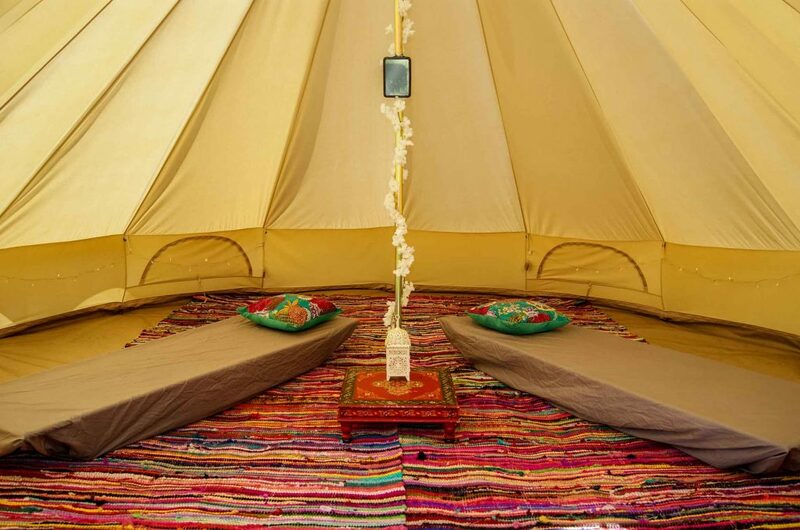 The delivery charge will be in addition to the bell tent hire charge. It will be based upon the distance from our base in Sussex to your venue and the amount of tents that are hired. The charge will include fuel for 1-4 vehicles, set up, delivery and collection. This charge is usually paid for by the client but can be split among your guests if the amount is agreed beforehand. We usually come and set up the day before the event and take down the day after so that we do not disturb any proceedings. However, if this is not suitable with your venue, please talk to us and we can arrange a suitable day. There are two options for booking. You can send your guests a web link (which we will provide) and they can book directly with us, allowing you more time to concentrate on finer details for your event, or you can book all the tents yourselves as a group booking. To reserve your tents we require a deposit of £50 per tent which will be refunded to you within 14 days of the end of the event, assuming that there is no damage, loss or excessive cleaning. The deposit cannot go towards the cost of the delivery. To reserve 10 tents is £500, 20 is £1000, 30 is £1500 and so on. All prices include VAT and are subject to our terms and conditions, and availability. At Loveabell, we realise that every event is different. Our friendly team are very flexible so if you would like something special or would like us to add something to each tent, please get in touch and we can give you a quote for any little extras.